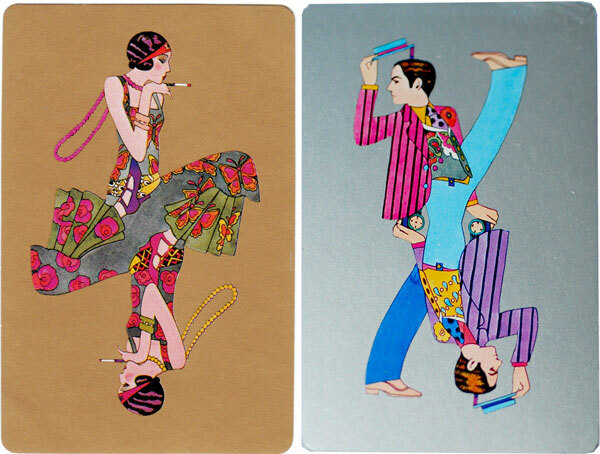 Above: “Roaring Twenties” playing cards published by Angel Playing Cards Co Ltd, Japan, 1980. 52 cards plus 2 Jokers. The reverse shows another double-ended design with gold or silver background (click to see more). Images courtesy Rex Pitts. The Roaring Twenties roared with Jazz music and new inventions which changed the world, leading to the rise of consumerism... cars, refrigerators, radio, and so on. The emphasis was on having fun and spending money; fashion entered the modern era. These “Roaring Twenties” playing cards, published by Angel Playing Cards Co Ltd (Japan, 1980) are supposed to evoke the spirit of this era with colourful and original artwork, which looks more like retro poster designs and looks better enlarged. The court cards are double-ended but each end has a different illustration.